FC fiber optic attenuator is used in FC connections. FC fiber optic attenuators feature a proprietary type of metal-ion doped fiber which reduces the light signal as it passes through. This method of attenuation allows for higher performance than fiber splices or fiber offsets, which function by misdirecting rather than absorbing the light signal. 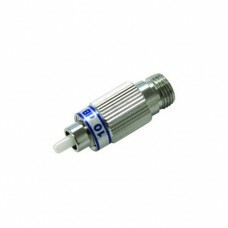 FC fiber optic attenuators are used in single mode applications at 1250 to 1625nm wavelength range. Ingellen supply FC APC single mode fiber optic attenuator and FC UPC single mode fiber optic attenuator. Our FC attenuators are manufactured and tested according to the industrial standards and they are 100% compatible to use with equipment and components from other suppliers.